I think I finally came up with a simple eChucK Lunetta board that is simple, cost effective, and easy to use. It's just a breakout board. It has a 20 pin socket, a 0.1uF supply cap, and two rows of 10 pin screw terminals on the sides. That's it, the only part is one board. You put your Lunetta chips in the sockets and then hook things up with 22ga solid wire, creating an eChucK sculpture that is a Lunetta too. If you need any discretes you put them in a socket and just tap off of the pins at the screw terminals. Pots are those little thumbwheel dealies so they go in sockets too. If you need an opamp you just insert the chip and wire resistors and caps directly to the pins. To make this prossible I could just create a single board and have the board house make as many as they can do for say $100 or so. Thoughts? Suggestions? Any interest? BUMP! I'm bumping this thread because nobody replied to it yet. So what do you say, yay or nay? Slacker, they'll be nice and cheap. Since they will be prototypes I will sell them at cost plus shipping, rounded up to the nearest dollar or something. I'll get to work on them really soon. Do you have any design suggestions? Sounds like you've pretty much got it covered. I think a 20 pin socket and 20 connection points should be enough for most things. I would make sure the screw terminals are big enough to shove a couple of wires into. That would allow people to join pins together or hook up pullup/pulldown resistors, LEDs or whatever they like as well as using the terminal to attach input/output wires. If there's any spare space you could maybe include a little perf board style area for hard wiring things. Perfboard area: check, will do. There are two methods for mounting discretes, in the terminals as you describe or use a separate board for your discretes. We can also combine the two, for example a 14 pin DIP would have one free pair for a supply cap and two more for resistors or whatever. But yeah, in any case I'll make sure that the screw terminals will hold two or three leads. I'm kind of excited about this concept, so I think I'll give it a shot tonight. I need to make a few library parts, draw a simple schematic, do a layout, and research the parts and footprints. Then I'll produce some files and post them, so check back later tonight or tomorrow and hopefully I'll have something for you to review. This little breakout board just makes SO much sense for eChucK, Lunettas, and prototyping in general that I've got to make it first priority. That plus it's just about the easiest circuit board that one could design. I happen to have half-price off of my next board order from ETekNet, so I'll use that for these boards. That will make it about as affordable as possible. Catch you later. The cost of the terminal blocks is about $3 each at quantity 10, or $2.60 each at quantity 100, so much of the cost is in the terminal blocks. That's OK because they are the real enablers of this approach. The board turned out to be 1.1 x 1.5 inches. 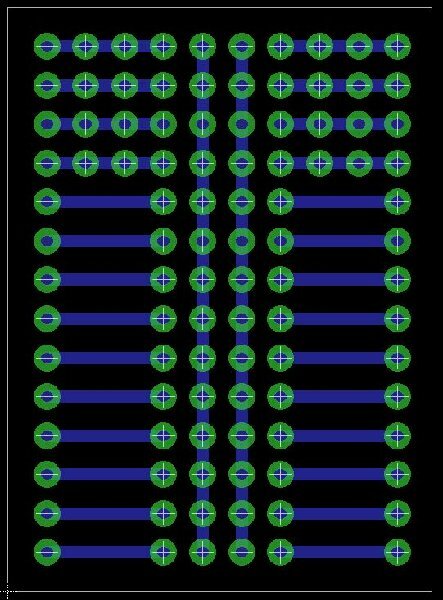 Based on my prior pcb with ETekNet, that would be about 25 or so boards for $100 if we did it double sided with solder mask and screen printing. It looks like the board can be single-sided without solder mask or screen printing, though. So I'm guessing that without the process of plated vias and top copper, we'd get twice as many for $100. Then I get the half-price discount for one order, so maybe we can get 100 boards for $100. That would be great. Or maybe 50 for $50. I hope so. The board, shown below, has the terminal blocks on the left and right sides, the chip in the middle, two bus lines running up the length, and a 4x10 prototyping area. The same pad shape, size, and drill hole is used for each location. The holes are sized to accommodate the terminal blocks which have slightly larger pins than a socket or resistor or whatever. I'm going to send an email to ETekNet in the morning, and maybe we can have the boards delivered by the end of next week. Also please note that there is not much difference between this board and certain types of protoboards or perfboards, so if you've got some of that stuff you can chop it up and make a few test boards at only the cost of the connectors. OK, that's all i have for now so just let me know how many to order and we'll take it from there. Cheers! After a nice nap and a great show by Jez (modulator_esp) on our radio station, I looked over the design and gave it some thought. I arrived at a new design, shown below. It's smaller so it will be cheaper and it actually works better for a few reasons. Thing 1 is that I realized the 10 pin connectors are not really needed in most cases as the chips are typically 14 or 16 pins. Sure, we want to accommodate chips up to 20 pins, but why pay 30 cents per terminal for terminals we are not using? Better to order a selection of 7 and 8 and 10 pin terminal blocks and use them where needed than to always spend cash on 10 pin terminal blocks. 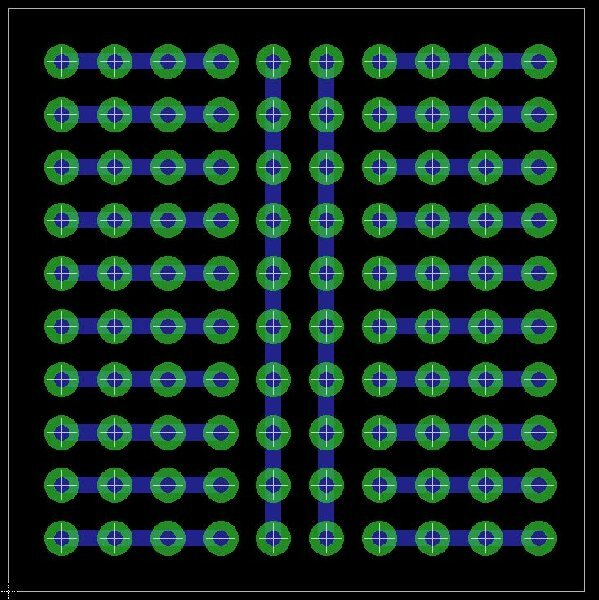 Thing 2 is that I realized that if the board does accommodate 20 pin chips, then when we use 14 or 16 pin chips, with the new board there is a breadboarding area for discretes above and/or below the chip anyway. So why have an extra prototyping area? In other words I just sort of smooshed everything together. Thing 3 is that by making the board this way it becomes a general purpose prototyping board that can be used in many ways. Why not just buy protoboards and cut them up? Because cutting them up is not easy nor does it lead to neat, clean results. Also this design has the power and ground rails running underneath the chip instead of at the sides, which is what we need. Besides, protoboards are a rip-off unless you find a cheap supplier. I had some other things in mind but forgot what all the various considerations are - hey, I'm not a machine eh? The only thing I don't like about this design is that the terminal blocks will partially obscure the second inner column of pads. But so what? That's nothing to worry about. So anyway, I'm now pretty happy with this approach and I think I'll go ahead and set up the order without waiting to gauge more interest from more fellow Lunetta-heads. This is because I will use whatever does not get sold at cost to others. So slacker, just let me know how many boards you want. They should be about $2 or lower each. Please feel free to offer suggestions if you have them, thanks. I would put a spare rail or two at the top and bottom that could be used for power/ground etc. and perhaps some sort of mounting holes. Awesome stuff! I would be down for a bunch of these. The only way I've found to make perf-board economical is to get big sheets of veroboard & cut them up, cool for alot of stuff, but lunetta ccts. can be so tiny its often more trouble than its worth. power / ground rails would be cool as well - if they have holes+vias, the vero I get has those thin strips of copper, with no holes, which are pretty useless IME - I usually remove them so they don't short with mounting hardware etc. Thanks for the suggestions, Adam-V, but don't you know it, i just told eTekNet to go ahead and make the boards. I can include your suggestions on the next batch of boards. So anyway, the price will be around $225 for 100 boards. I figure I'll just round that up to $2.50 a board to make the numbers easy. I'd rather go at-cost exactly, but man why bother at that price? We should get the boards on Monday November 9th, and I'll be able to test them to make sure the connectors fit, that way you are guaranteed boards that actually work. I also have in mind my first eChucK Lunetta circuit. It will be a Boolean Sequencer driving a set of Lunetta oscillators that get combined together perhaps via XOR or summing amp to create the music. I plan to arrange the boards in a simple sculpture. DGTom, my apologies for not responding right away, your post snuck in without me noticing. Um, OK. I figured out that for a 14 pin chip the board allows us to add a decoupling cap as well as power and ground connections very nicely. The power/ground rails run vertically under the chip as you can see. Then you just add jumpers to connect them. Also, for 555 or opamp circuits we have a reasonably generous array of pads for discretes. For passive components like some pots or LEDs, this works also. As for mounting hardware, in the world according to eChucK, we don't need any. That's because we use 22 gauge solid wire for interconnect, and the wire is strong enough to support the boards in any desired physical arrangement. The idea is to create "sculptures" of electronics. Anyway, we've got 100 boards on the way. I sure hope I got the hole size right for those connectors. I checked twice that it was OK but you never know what chaos will ensue when you make a board. So just let me know how many boards you would like to purchase. To repeat, it's $2.50 each plus shipping. Looks good Les, put me down for 5 assuming shipping them across the pond won't be anything stupid. Just need to find a local source for those screw terminals now. Whoot! It's a partay all the time! I'll have ten of those board, Les. I actually have my own screw terminals, so send me a PM when you have the boards ready and I can Paypal you. OK electri-fire (Matthe), I'll pm you when I get the boards which should be November 9th or thereabouts. p.s. any idea what you want to build? I'm going to build Chiphenge! p.p.s. just for fun, maybe we should start the tradition of actually naming our eChucK Lunetta sculptures, like they do with huge modulars... could add to the fun! any idea what you want to build? I'm going to build Chiphenge! I want these as convenient "generic" little boards, will probably build me another Lunetta. Building my first one on a single piece of perfboard has proven to be hard to debug. Keep each circuit on it's own board to give me some more grip on what's happening. Reduce wire lenghts by keeping each board closer to the knobs, in/outputs etc..
Easy reconfigure the setup, change modules, keep removed boards intact for reuse in other projects. Cool, Matthe, you're right, it's just a breakout board so you can use it any way you like! I enjoyed debugging your power supply with you and seeing the LEDs work after we cleaned it up. I can see how these eChucK Lunetta boards would really do a neat job for a standard Lunetta panel configuration. More power to ya! The boards will be here today (Monday 11-9-2009)! I know this because UPS made a delivery attempt Friday, a day early of schedule, and left a note saying they would make the second attempt today. So cool on that. For my first project, I will attempt to build an eChucK sculpture I call "Chiphenge", so named because the circuit boards will be arranged in a circle standing up. A block diagram of Chiphenge is shown below. 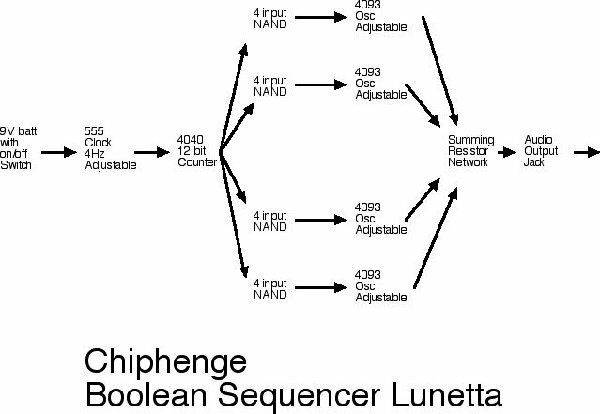 Chiphenge is a Boolean Sequencer Lunetta. This means that it has a counter and some logic gates wired to the counter outputs - that's the BS part. Each logic gate drives a NAND oscillator, which means that the osc will fire whenever the logic gate output is one. These four oscs, two per side, then get combined together by resistors and sent out an audio jack to your mixer or in my case to ChucK for further audio processing and recording. To change the song, you just rewire the logic gate inputs, and the song just runs eternally as long as the power is applied. Interestingly Mel, who just joined the forum, and who I met at EM09, would like to buy some noisemaker thingies for his performance so I'll build two and demo one to Mel. He can buy it at a little bit above cost if he wants to, if not I'll have two of them playing two different songs! Way cool, huh? What will you do with your eChucK Lunetta breakout boards? Edit: note: those are 4-input AND gates in the diagram, not 4-input NAND gates, sorry for mistake! Building my first one on a single piece of perfboard has proven to be hard to debug. I had the same issue electri-fire. Plus, once I had the flying wires hooked up it was nearly impossible to do anything with the circuits as far as changing them. The boards are here! See the photo below for a shot of them! ETekNet did a most excellent job on these little gems. I can't believe I got SO MANY boards for just $225! And that's with NRE charge to boot. The holes are small, I hope they fit the screw terminals. If not then guess what? They are solder only. lol. We'll get it right sooner or later. So now it's time to nail down quantities and addresses. PM me address and quantities, thanks. How many total do you have, Les? If you have some after the bunches are taken and spoken for - let me know. I'd take a skosh, a few, or a bunch off your hands..
100 in total, bruce. I just put a chip in one and it fit just fine! I don't know if the chosen screw terminals will fit, but they should because I made the hole size one smidgen larger than their datasheet recommended. pm me with address and quantity if you would like some of them. Oh, and by the way for international paypal payments (this means you electri-fire), paypal charges a little bit for the exchange rate or whatever. So add something like 5% or 10% on top of board cost and shipping for that, it would help out - thanks! So Les, your building ChipHenge for Mel? I'm interested in having one prebuilt as well. If possible some other CMOS modules prebuilt also, like some 4051's if you have them. 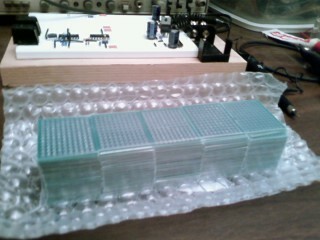 I have some post EM09 projects I'm working on now and getting a little "solder tired". Yes, Matthe, I'd be happy to build you a Chiphenge for sure! Also I'm interested in making a "Tie Fighter" which will physically resemble the famous spaceships of the evil empire from Star Wars, but actually be a ring oscillator. Both modules will have audio out jacks (no speakers) to PC or mixer. I'll sell them at cost plus 50% of cost as profit, which is cheap for you and a little something for me too. 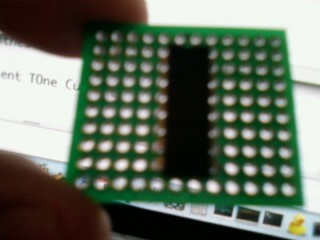 Here is a photo of an echucK Lunetta board with a chip in it, unsoldered, just for test purposes. This is fun! Whoot!